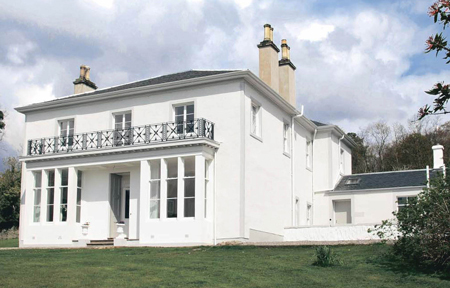 A RHU mansion built by Madeleine Smith’s father was offered for sale in July 2008 with an asking price of £795,000. Carbeth House is high above the village of Rhu and has superb views over the Gareloch and the Clyde. Carbeth, which has a one-acre garden, was built around 1855 by the renowned Glasgow architect James Smith as the dower house for the neighbouring Invergare, which was originally named Rowaleyn. He designed, amongst other famous buildings, the Victoria Baths in West Nile Street (1837), the Collegiate School, Garnethill (1840), the McClellan Galleries (1855), and Bellahouston Church (1863), all in Glasgow, and Stirling Library (1863). He was born in Alloa in 1808 and in 1826 he followed his father — who had been awarded a building contract for the Royal Exchange Square by the architect Douglas Hamilton — to Glasgow. 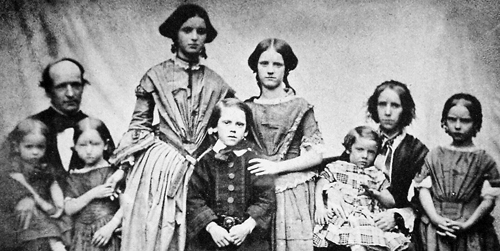 He became close to the Hamilton family and in 1833 he married Douglas Hamilton’s daughter Janet, with whom he had five children (he and his family are pictured below) . . . and Madeleine (the tall girl), the eldest of this already famous family, was to become infamous. She had an affair with a Frenchman, Pierre Emile L’Angelier, which mostly took place at Invergare which had been built by her father as a weekend and holiday retreat. But in 1857 L’Angelier was discovered poisoned by arsenic, and Madeleine, then aged 20, was accused of his murder. The subsequent trial at the High Court in Edinburgh was described as the trial of the century. The case was found not proven, but the scandal brought social disgrace to the Smiths, and they moved from Rhu to Bridge of Allan and then to Edinburgh, where James Smith died in 1863. Carbeth House is an elegant B-listed period villa which has undergone comprehensive refurbishment, with care taken to retain the wealth of period features which include magnificent decorative cornicing, a fine cupola on the first floor landing, plaster pilasters and Corinthian columns. The villa has two symmetrical, projecting five light windows which support a decorative cast iron balcony. This balcony forms a porch with recessed panels and simple moulding. The ground floor accommodation consists of reception hallway, elegant drawing room with open plan music or sitting room to the rear, formal dining room, kitchen, laundry room, stores, shower room, pantry and large cloakroom. On the first floor there are five double bedrooms, dressing room, with the master bedroom suite having a shower room and a dressing room or child’s bedroom, and two bathrooms. A driveway leads to the front of the house, and there is a stone built potting shed with outside store. ■ A dower house is usually a moderately large house on an estate which is occupied by the widow of the late owner. The widow, often known as the ‘dowager’, usually moves into the dower house, from the larger family house, on the death of her husband, and the new heir occupies the now vacated main house.